1 in. 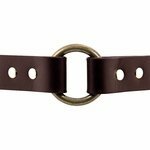 Leather Center Ring Dog Collar by Filson -- BROWN. $59.95. "Well made and sharp looking"
The collar is just what I expected from Filson. Well made and sharp looking. The service that I received from you all at Gun Dog Supply was equally as pleasing; very fast and with top notch follow up. Thanks! "All around, this is the best collar I have ever had. Steve's advice on the tag is worth taking, too." This is an excellent collar. It is made of high quality leather, and it looks and feels great. The collar wears well. Our dog goes through underbrush and is in the water daily. The collar is standing up to all this punishment. In fact, the collar looks better now than when we first received it. All around, this is the best collar I have ever had. Steve's advice on the tag is worth taking, too. "I love it. I think it is so classy"
My son bought one of these collars for his dog, and I immediately wanted one for my dog, Snapper. So we waited until his second birthday, and he got one. I love it. I think it is so classy, and the nameplate helps us to keep him safe. Excellent quality collar. ID tag is nice and was delivered quickly. "This is the third collar I've purchased, and I'm just as happy with this one as the other two!" This is the third collar I've purchased, and I'm just as happy with this one as the other two! Awesome collar. Looks great on my GSP. American made also a big plus! "Collar was in the mail by the end of the day and shipped fast!" Collar was in the mail by the end of the day and shipped fast! Free ID plate is a very convenient option. "Filson products are already top quality." This dog collar has been working great for Blue and I. Filson products are already top quality. 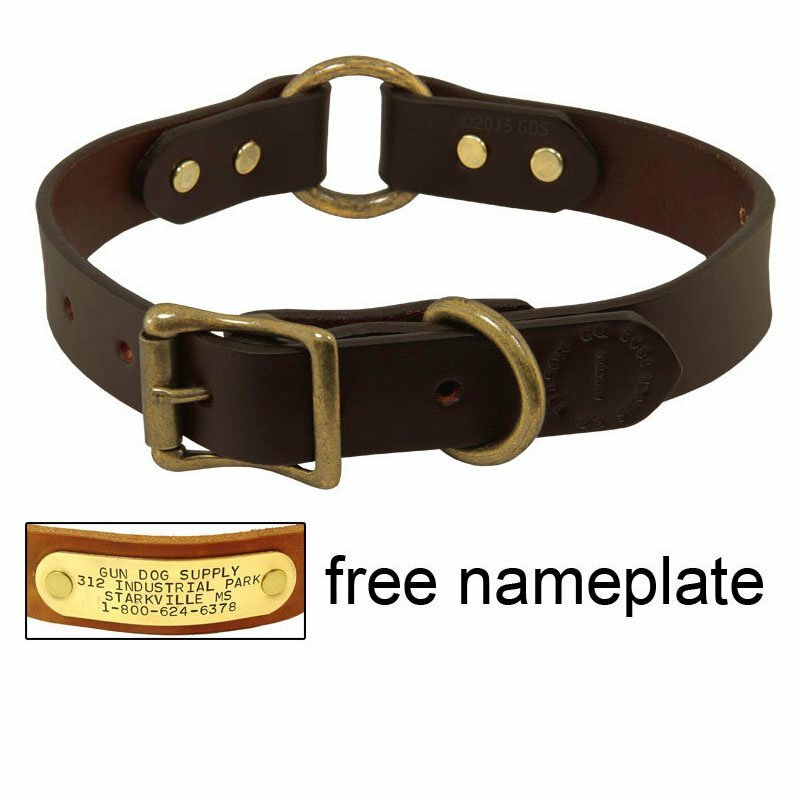 And then Gun Dog Supply puts a name tag on the collar for the same price as a normal collar would cost on Filson's website. Great stuff. Good collar. Does well when gets wet. Looks great. Would recommend. "Excellent look, durable, and quality craftsmanship." Excellent look, durable, and quality craftsmanship. As usual, no complaints. Excellent product, excellent service. Great quality. Looks great even on a city dog. Great collar. We love it. Highly recommend. "This collar is well made." This collar is well made. It should last years if not the life of my dog. Everything was spelled correctly on the free nameplate. This purchase was made super easy by gundogsupply.com. Wonderful color leather and brass! The product is very rugged and seems well put together. "Well made, classic, and built to last for many years." Labrador Retiever. Hunts. Family pet. Competes. 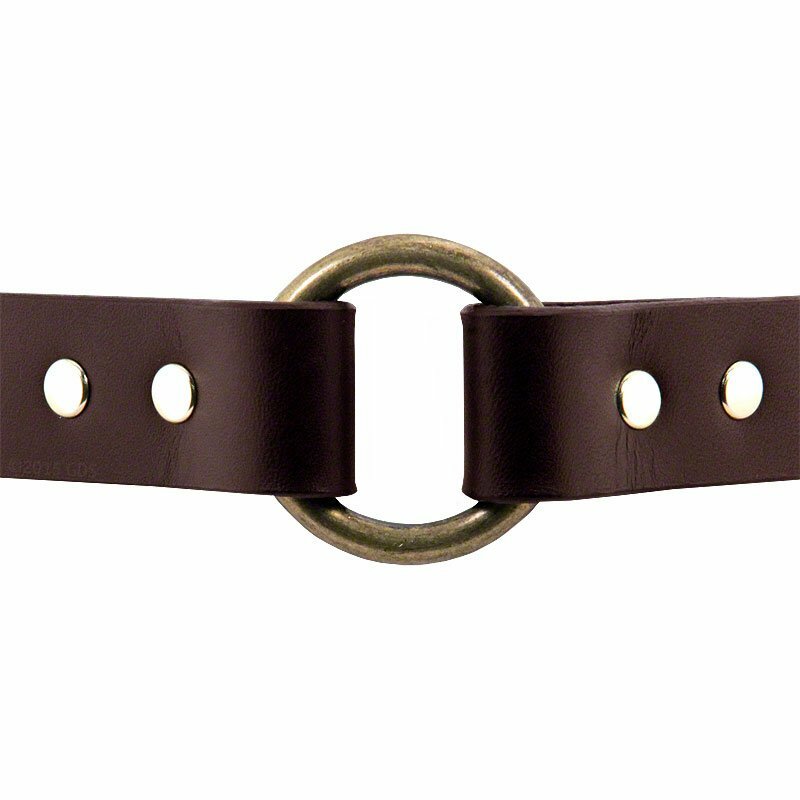 I have purchased many great Filson products over the years and this leather center ring dog collar is no different. Well made, classic, and built to last for many years. It's absolutely beautiful! If you need any pictures, let me know. I'll send y'all some. "Very nice looking and good quality." Beautiful leather! Can't say anything bad about any Filson items I have. Looks great on a chocolate lab. Fits large. Looks very nice. Well made. "I've had this collar for at least six months and love it. It has a nice simple and rustic look." I've had this collar for at least six months and love it. It has a nice simple and rustic look. Given time and some leather conditioner it has become so soft and has a wonderful worn in look/feel. I like it so much I just purchased another for our new dog. Forrest Loves his new collar. Your staff is the best at helping with sizing. Quality hardware and nice leather. I have one on each dog. Best collar I've ever purchased. Free nameplate is a great addition. I love the collars flexibility. I'm a leather only collar type of person, and this collar has me fully impressed, not to mention the nameplate is a huge plus. Love how this collar works AND looks. I would definitely order it again. Looks and works great. I had people notice and comment positively on it. I love my new collar thanks again. I love the product. I actually ordered two collars the wrong size on accident. With no problem I sent them back and received the two correct sizes with the nameplates very quickly. Thank you for the speedy return and the great customer service. Excellent quality. Lots of compliments. Follow Steve's measurement video, NOT an assumption. I ordered the 14NS because the 15NS I purchased 2 years ago is about 3 inches too long (the generic steve's pick collar). What happened is I regularly clean and treat the collar with saddle soap after it gets wet and dirty in the field. It stretched over time. Granted, I personally think the character of the leather is better than new, I should have measured first. I have a 5 month old pup that is looking great in the filson. I'll get another one later. Side by side, it is worth the extra $18 if you are proud like me and want the better looking collar. Top of the line collar. Great fit and function. Very pleased. 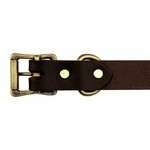 The collar is what you would expect from Filson -- beautiful! The service from Gun Dog Supply was excellent. Usual high quality from Filson. Collar and nameplate more than I expected. Quality is unsurpassed. Of course, Gun Dog Supply's customer service is, as always, simply the best. 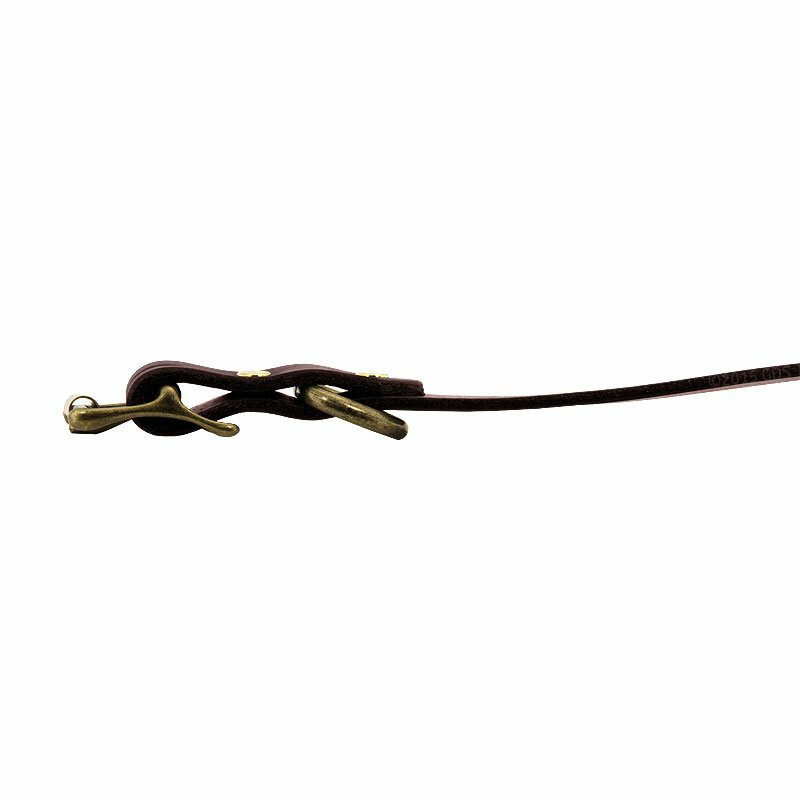 These collars work great, wear well, and the center ring makes it really easy to leash a dog. "I love the style and the color. It looks great on my dog." I love the style and the color. It looks great on my dog. It's a bit stiff, but I assume it will get broken in over time, and doesn't seem to bother my dog when he wears. He only wears it a few hours at a time. "A great quality durable collar that will last for a long time." 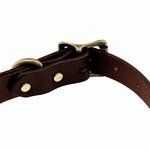 A great quality durable collar that will last for a long time. "Steve and his team went above and beyond for me. Great company." german short hair pointer. Hunts. Steve and his team went above and beyond for me. Great company. "It's a great collar. My dog loves it, and it's easy to clip to." Its a great collar, my dog loves it and its easy to clip to. second most durable collar i have ever gotton for my dog. i ordered one through them before that was the same great quality but for my King Shepard, that collar was beastly by comparison. I will keep coming back for any of my collar needs. Now i just need a non nickle plated choker. dang things just keep turning my dogs neck grey. "Really nice looking collar. Has held up well after two months of wear." Really nice looking collar. Has held up well after two months of wear. "It looks like it will last a long time." "Awesome collar! 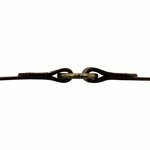 Another great Filson product"
"Great looking and great quality"
Great looking and great quality. Will be buying a matching leash. Thanks GDS! "Nice and high quality looking collar." Nice and high quality looking collar. Really like the heavy brass hardware. I wish I had ordered it slightly larger so end would stay in keeper. It is on 2nd to last hole and end doesn't reach keeper, so brass ring keeps getting stuck up under buckle. Durable, high quality leather. Just what we were looking for! "Perfect for our dogs. They look amazing." Perfect for our dogs. They look amazing. "Excellent craftsmanship like all Filson products." Labrador & Braque Francais. Hunts. "Breaks-in nicely, and looks better with use." 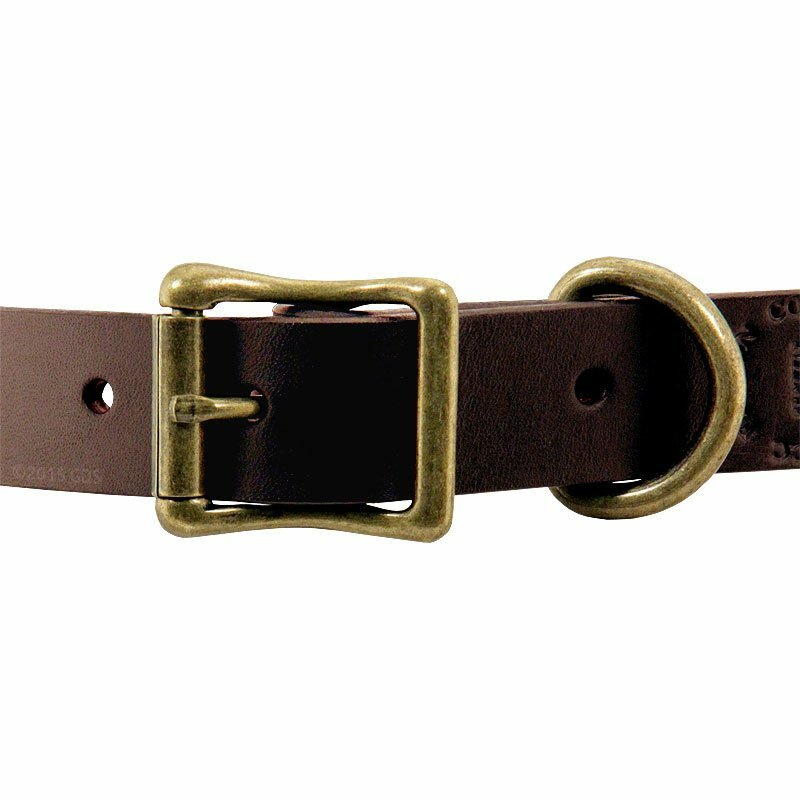 This Filson leather collar is nice! 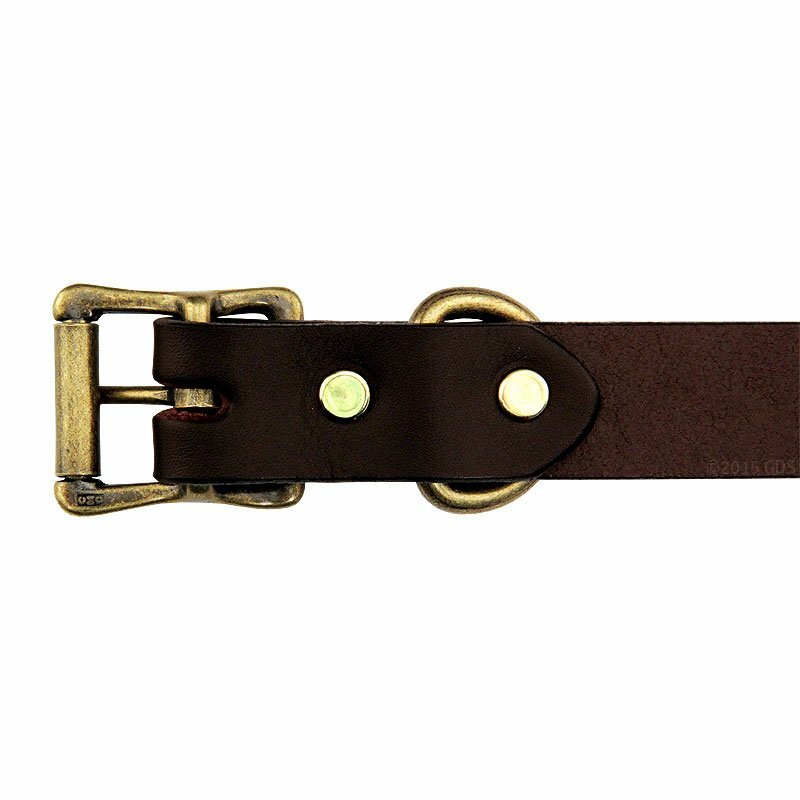 It is a substantial strap of sturdy leather without being bulky. The leather breaks-in nicely, and looks better with use. Will buy it again. Looks great on! Get compliments on it, buying a second one. I've only had it for a couple of weeks, but it looks like it'll last a lifetime--high quality leather and hardware. The sizing directions on the website are useful. The fit is perfect. "We love Pepper's new collar!" We love Pepper's new collar! The Imprint looks great, and the leather is great quality. The item was delivered quickly as well. Excellent quality and perfect customer service! "Gun Dog Supply made an awesome collar and name plate for our pup." Gun Dog Supply made an awesome collar and name plate for our pup. I made the mistake and spelled the name wrong and Gun Dog Supply make the quick change and still had it back to us in a week. We'll definitely be back. "Very classic and comfortable fit." Black Lab Mix. Family pet. Love this collar. It fits big, so I had to resend it to get a smaller size; very fast service. I'm happy I went ahead and made the exchange, cause this is one great collar. Very classic and comfortable fit. "Gun Dog Supply is awesome." Gun Dog Supply is awesome. They are fast and very helpful, as I am learning with my first upland dog, and I love the support and advice they offer. "I've had this collar for at least six months and love it." Great collar!! Going to take a long time to wear this one out!!! "A great place to purchase dog accessories." The 2 collars I purchased seem durable, a lot of room for growth adjustment, especially appreciative of the tag being attached to the collar and all of the information you are allowed to put on the tag. Now, my pups are only 4 months old, and I will definitely buy the same type of collar from Gun Dog Supply as they grow out of the ones I currently have. A great place to purchase dog accessories. "The collars are so classy yet durable and functional." We have bought Filson dog collars for almost ten years, but when we saw these for the same price as Filson sells them direct, with engraved name plates for the same price, we jumped on it. The collars are so classy yet durable and functional. We will always continue to return as customers. Thanks again. "You cannot get a better leather collar." This collar, as with all Filson gear, is top notch. You cannot get a better leather collar. "Great products and fast shipment!" Great looking collar. My only advice is don't leave it on when dogs are kenneled together, or one might have it for a snack. Apparently they taste as good as they look. "I love it. Great quality, and it looks awesome on him." I love it. Great quality, and it looks awesome on him. Love the site. I only order my collars from here. Long lasting and worth every penny. "I love these collars. They're very soft and durable." However probably ordered it too small as in the last hole, tight, but I can still get fingers under it. Might have my husband punch another hole in it. Very nice collar. Have only had it a few weeks so cannot comment on wear but it is a strong handsome piece of leather. I expect it will be around a long time. I somehow did not measure correctly and it is too big, but usable. Otherwise, it is excellent, the quality and the look are just what I wanted. Next time I order from you, I will ask for help in measuring. "The collar is beautiful and fits nicely." The collar is beautiful and fits nicely. However, the leather on one side was attached incorrectly and was sewn inside out. It still works. If I'd had another collar, I would have returned it to be fixed. However, it is still nice looking and extremely durable. I would still recommend it. "Nice setup, but thought the leather was thicker." Nice setup, but thought the leather was thicker. All in all it was a good, well really good product. Looks good on the dog too. Directions said to buy one size up if between sizes. It's too big. Looks awesome though. The leather is very thin. I expected more from Filson. You are paying for the Filson stamp. The overall quality is average. To be honest the Leather is of poor quality, and not what I have expected. It's to thin and even after applying a leather conditioner and working the leather it remains stuff and displays signs possible cracking. The leather is not of US more along the same leather purchased from Mexico. Fusion should reconsider their supplier. It's ok, but I'd recommend dura-soft brown collar instead. I have 2 of those and like them better. I own several great Filson products, but this is not one of them. The leather is very brittle. I was expecting something with a bit better fit and finish. For the price, I cannot say that this collar is worth it. I have been far more pleased with the other leather collars I have purchased from Gun Dog Supply. Gorgeous collar. Loved it...but so did Boone. He ate it, all of it, on the 8th day of wearing it. Really expensive dog treat. This collar was purchased in late April/early May. It's been worn just about every day since then. It shows wear FAR beyond what should be expected out of a brass and leather collar for the three months or so that it's been worn. The leather is getting stiffer, not softer, and despite oiling it and keeping it clean, the brass is wearing on the leather at the buckle. The nickle hardware is already starting to rust, and the interior of the collar is almost coming apart. I would not recommend this product to anyone. I am extremely unhappy with this purchase. 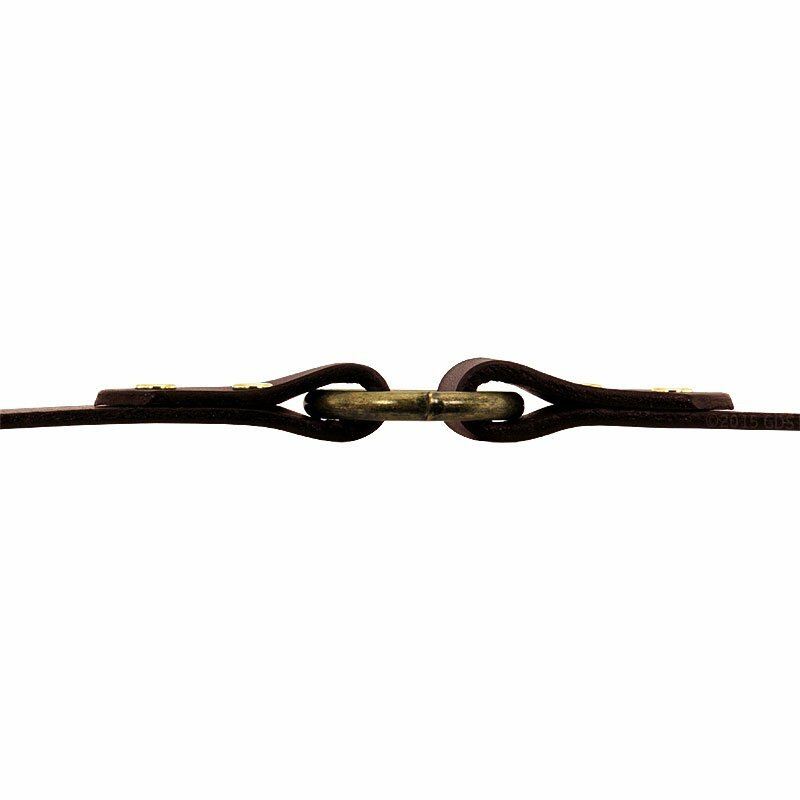 Dark brown, 100% vegetable tanned, genuine bridle leather. Features center "safety" ring and D-ring keeper.